For as many years as I have been watching my weight, I have not once tracked a whole day’s worth of calories. Sure, I’ve tracked more days than I’d like to admit worth of Weight Watchers Points, but never calories. Crazy, right? This week, I decided to change that. On Wednesday, I put everything that passed my lips into SparkPeople.com to see how it would measure up against the WW points+ and I thought the results were pretty interesting. I honestly had no concept of how many calories I would be eating because I eat A LOT of fruit and veggies, which are no points, but obviously do have calories. I know the calorie counts of a lot of different foods by heart and always look at nutrition labels, but in terms of an entire day, I had no idea how it would play out. First up, I went into SparkPeople.com, set up a free account, and set my weight goal and time hoping it achieve it. Based on the goal of losing 7 lbs by June 1, it says I should target to eat between 1280-1630 calories per day. I honestly have never thought about large picture calories before, but 1280 seems very low to me considering that I’m pretty active, but I have no basis for thinking that really. I didn’t change anything about what I was eating based on the goals it told me, and just entered everything into the tracker. 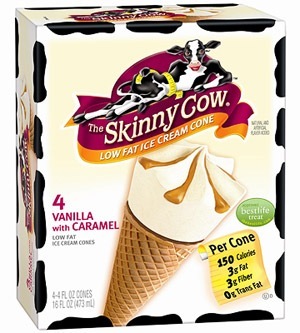 Dessert (10pm): 1 Skinny Cow Vanilla with Caramel Cone (4 pts+) (150 cal, 3g fat) I know. I think it’s interesting to see that breakfast was 410 calories and only 3 pts+, but lunch was only 317 calories and 7 pts+. It’s too easy to get sucked up into numbers so this is not something I would do every day by any means, but it’ was really interesting to look at for one day. Sparkpeople.com told me that I went over on both calories and carbohydrates, but that I was on target with fat and protein. Though I did eat a good amount, I felt like my day was pretty balanced, though I imagine a lot of the carbs are from the excessive amounts of fruits and veggies I had. Doing this exercise makes me realize that counting Pts+ is better for me, because I think I would feel restricted if I had to stick to a certain number. Knowing I can pile on the fruits and veggies if I’m still hungry gives me a certain sense of freedom that I don’t think I’d get if I was strictly counting calories. So what about you? Do you track calories, points, both, or neither? Have you ever looked at calories and points side by side? Were you surprised by the results? Which method do you prefer? I’ve tried counting points before and I’m generally good at breakfast and lunch, but dinner is always more elaborate and I slack off. Great tips though and I love Skinny Cow treats! This is an interesting post and gives me some food for thought. I’ve never been on WW and although I’ve tried to count calories I really think its too much work to do on a daily basis. As a vegan, I’m much more concerned with trying to get the proper balance of micronutrients and try to eat while thinking about that rather than calories. I do like the premise of the new WW program (what I know of it) because I don’t think all calories are created equal. This is what I love about your blog, Beth. You really do some fun/interesting posts that I always feel I take some knowledge away after reading. I think your connection with WW will really add to what yout posts can offer (like the 4-5 servings of fruit are baked in – awesome to know!!). Anyway…I did Spark for awhile and I kind of felt the same way you did. I really love the new Points Plus program as it feels less diet-y. I’ve had most of my success on the old Core program. I haven’t been to a meeting in awhile to know what changed with that on this new program. Any thoughts? I felt most like I was eating like a normal person when I followed that plan. aww thank you!! your comments always make me feel so good. Tracking calories has helped me lose about 30 pounds. I attribute tracking to helping me recognize portion control and healthier swaps. I actually signed up the for the Daily Plate as a test before I tried WW. Since calorie tracking worked for me, I never signed up for WW so I could save $. I think it also depends on each person’s personality. I just happen to enjoy seeing the numbers and I certainly feel accountable. First off, congrats on losing 30 lbs!! I know a lot of people who have had success with counting calories and I think it can be a great thing for some, for sure. For me, the second I start to feel restricted, I start to rebel. I’m not sure who I’m really rebelling against since it’s just me that I’m hurting in the end, but having the “free” fruits and veggies helps me feel like I don’t have to limit myself. When it told me I was over my calories for the day and also suggested I stop drinking regular soda (which I don’t, and hadn’t entered into the tracker) I was a little turned off because I know if that was the system I was counting on I would have considered myself as a failure, and would have just given up and eaten away my troubles. I understand I still have some things to work through, obviously! Thanks! It feels strange to admit that amount since it’s taken 3.5 years (and I’m not quite done yet), but I am proud! I am trying to be conscious about choosing mostly “whole” options, but your dessert post did resonate with me! I would have also been turned off by the message that you got from the system that you tried. I like Daily Plate/Livestrong because I can monitor fat, protein, carb, and fiber intake. I’m glad that we all have different options to try out and find what is best depending on our lifestyles and personal preferences. And thanks for your sharing your journey! It gets me thinking and keeps me inspired! A few months ago, I was tracking calories and became obsessed. But it worked and I lost weight. I joined WW (again) though because once I stopped counting, I gained it all back. I need the accountability + structure of WW, I think. Thanks for posting this Beth! I have done experiments like this putting Points+ up against calories. Just like on the old WW plans, WHERE the calories are coming from, were not figured into the equation. I think its important to know where they are coming from, in order to have a well balanced diet. For me, calorie counting would never work – I would have like 5 servings of 100-calorie pack chips or cookies a day! ha. Counting P+ really helps me keep in check! When I first joined WW i wanted to compare points to calories so, thanks for doing it for me! lol. I too felt that calorie counting felt like i wasn’t eating much but points i was eating alot. every time i stepped on the scale on weigh in day i couldn’t believe i was losing because i was able to eat so much. i stopped WW at the beginning of this month. i did the 3-month online special thing. plus i didn’t want WW to wear out its welcome with me. my goal is to start running (i’m doing c25k) and when i reach a plateau, i’ll go back to WW (although the weather here in cleveland has been AWFUL for running conditions, but 70s are forecasted now). just seeing this exercise in points v. calories has me missing WW and the structure yet freedom i had. i better get back on soon before i sabotage my health again. I track calories, protein, and fiber – with a bigger emphasis on protein (because I lift and swim a lot) and fiber (because I have a strong family history of colon cancer). I also like logging all my foods on Livestrong because it spells out for me when I’m eating too much sugar or other junk that I don’t need and not enough fruit and vegetables. I’ve never done Weight Watchers and still remain unsure of what I think about points and whether or not it would be for me. There’s no way I could get to meetings, but I contemplate it once in a while. Also, for your smoothies, try Scharffen Berger cocoa powder – it’s intense stuff, no sugar, and low in fat. Only need a little – it’s worth a shot :). I wanted to get down to my “feel great weight” (thanks, carrots n cake!) so I have been counting calories using sparkpeople. I am only 5 feet tall and only had a few pounds to lose so my calorie range was SUPER LOW. 1200 – 1550. I usually hover around the middle, 1300-1400 because I am also training for a half marathon and running 15-25 miles a week. It did help me get down to my happy weight though! I did the same thing right when I first started WW, for about a week. I found that my calories and points were pretty much spot on. I tend to go over a bit on carbs, too, but that’s something I have to work on. Everybody is different, though—Heather Eats Almond Butter comes to mind. She said that her body works best on a high fat diet. So to each her own, I guess. I was thinking about the whole issue of fruit and veg being point free but not calorie-free, since I eat so much of them during the day, and I often wonder if I’m eating too much of them. But I guess if I’m over on my calories I’d rather it be because I’m overeating freggies and not gnawing on a loaf of bread. I agree that everybody’s bodies work differently and you have to listen and figure out what works best for you. I think the whole thing with me is that WW works better for me mentally so I don’t feel deprived, more than physically so. The new plan figures in eating up to 5 servings of fruits a day, so I think as long as you’re not eating to the point of feeling sick, you’re fine! I don’t track either right now — but when I was losing on WW I did try tracking both for a few days and it made my head almost explode so I stopped. The numbers were making me nuts! Now I just try to eat mostly produce, lean proteins, healthy fats and that seems to keep my weight steady. I’m glad you did this article! I’ve done both WW and Sparkpeople. I got frustrated with WW because I wasn’t losing and when I cross-tracked, I found that WW had me eating 2600 calories one day! Granted, I got 40 P+ but still….for me, that many calories equaled maintenance or gain. I would estimate that I now get about 29-31 P+ although I am following SP completely and have an allowance of 1600-1970 calories a day. I love WW but P+ wasn’t working for me. Different strokes for different folks! I love the emphasis on whole foods and have tried to carry that over with me to SP. I had the same experience with P+ and wasn’t losing anything! I never got too into tracking the calories, but I guess 29 P+ plus some of my weekly points = maintenance weight for me. What a great experiment! I’m a calorie counter (I’ve never done WW) but I do really like the idea of not worrying about the caloric counts of fruits & veggies (cause they’re GOOD for you!) I find while I’m not strictly counting EVERY single thing I put in my mouth anymore (though I did for a long time) calorie counting still works for me because it does keep me in a range that I know makes sense in the “weight loss math” sense: calories in – calories out = weight gain/loss/maintenance. Glad you did this though — I really enjoy all your insight into the benefits of this particular program, Beth! Interesting post! For the last month I have been counting calories using My Fitness Pal (for the first time in my life actually – my major weight loss was done following South Beach and WW) and surprisingly it has worked! My 2 month plateau has shifted to a 10 pound weight loss in 4 weeks! I’ve done every kind of diet out there at some point in my life and have a good knowledge base of what healthy choices are, so I am still making healthy food choices as I count calories. I entered in my weight and that I wanted to lose 2 lbs a week and My Fitness Pal told me that I had to eat around 1200 calories a day. It seemed like a small number at first, but I also get extra calories from working out so I usually average 300 – 600 more calories than that a day which has been plenty and I feel more than satisfied. Weight watchers used to work for me, but for some reason, the points plus didn’t when I tried it. I honestly think I was eating too much on it, even staying within my points. But a lot of people really love it and have had a ton of success so it just goes to show you have to find what works for you! That is good to know about the 5 fruits not veggies a day. I was feeling guilty and adding a couple pts on my day for all of the 0 pt fruits AND veggies I was eating! This is a great post! I used to be on Jenny Craig before rejoining WW. My Jenny Craig counselor put me on a plan where I would eat 1200 calories a day based on my height and weight (I’m only 5′ 2.5″) and with the assumption that I would have little to no exercise. Once I really started excersing intensely she upped my caloric intake to 1400/day. I did lose weight. 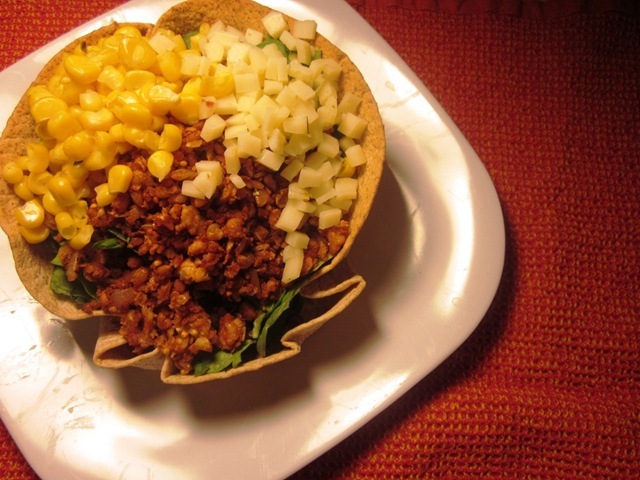 JC made it easy b/c everything is prepackaged and preportioned for you and you get a weekly menu. I need that kind of structure so I don’t have as much opportunity to cheat. But I didn’t like JC because it was way too much processed food and I wanted to eat less of that. Although I did love my counselor and really enjoyed the one-on-one meetings each week. I switched back to WW because I wanted to eat less processed foods and sodium. I also wanted to really learn how I should be eating and exercising on my own. I think that what someone said earlier is true, all calories should not be considered equal. I think that the new P+ plan does take that into consideration. 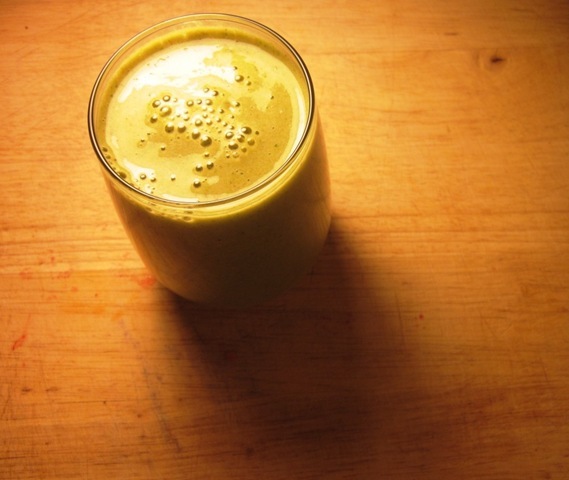 The bottom line is that you have to find what works best for you and your body. Unfortunately, figuring that out comes with alot of trial and error (at least for me). Tracking calories was not good for me. I started to restrict myself and become very obsessive over the whole thing. I think it has something to do with my personality type. I still watch the calories- but just with round estimates and general ranges… fitday.com is just unhealthy for me! I keep a general idea of my calorie intake but don’t track it every day. I think sparkpeople’s numbers are rather low and the WW pts+ seems MUCH more reasonable and healthy for steady weight loss without deprived feelings. I eat on average 2300-2400 a day while losing around 1 lb/week. Yes I’m nursing and that accounts for an extra 300-500 cals but that still puts me at 1800 cals comparitively. I think too many people diet too low calorie and it doesnt help at all.Youre doing great! I’ve switched to counting calories and I found it works better for me because I have a better understanding of what is going on. For me, Weight Watchers felt like using fake money or something, in that I didn’t really have any idea of how many calories i had used by the end of the day (not with the old system). I also am trying to up my protein so its easier to see on the calorie counting sites. I don’t track either, but I follow the same general idea as you. Eat a reasonable portion, then pile on fruits and veggies (mostly veggies) if I’m still hungry. I was the opposite with WW. The points started to freak me out and I was trying to eat the lowest points for things. Or I set point limits for meals (weird, I know). It made me drop out too much fat, even with the oil requirement. I love the flexibility of tracking calories for me. I’ve done that where I tracked both to make sure I was getting the right nutrients. On an average day where I would eat a couple of weekly points and try to hit all the GHGs I would be within the targets for everything, through at the higher end of the calories. I can’t count calories, it hurts my brain. 🙂 I like that WW makes Points Plus values easy to track, and simplified in my opinion. On the old plan I stayed hungry and miserable constantly so I decided to count points one day it was around 1000! No wonder I felt so bad! I quit WW then and didn’t come back til recently. I love the new plan. I eat about 1700 now, which I think is much more reasonable! This was such a great post Beth. I doing the points+, but I have often wondered what I am eating calorie wise. It is nice to see someone else’s results. I love this. What a cool experiment. I am a calorie tracker and I can attest to the fact that eating certain foods will make me mental because I see the higher calorie count. It could be a healthy snack–like a banana that’s 100 calories–but the fact that it’s higher than an apple (for example) stresses me out. I don’t do WW but I like seeing the breakdown and comparison regarding the fruit! Very cool! Thanks for this. i have been thinking about doing the same. I have been battling a plateau for awhile and thought it might help…but let me say I am too lazy to do the calories. I have lost my weight on WW but haven’t done the best on the new program. I have lost 50 lbs. by tracking calories, but that doesn’t mean I don’t like WW’s point system. I think they both work because, in most cases, it seems to keep you within a set range of calories, no matter how many fruits and veggies you eat. I do like the idea of eating more fruits and veggies if I’m hungry and not having to worry about their calories though! Still, my major hurdle is eating too many carbs, which may be a hurdle no matter which system I use! That is really interesting! And 1) I think 1700 calories is just right. Any less seems really low to me for an active person. 2) Fruit and veggies are so nutrient dense and filling that even if you get 800 calories a day from them, you’re probably eating that in place of higher calorie content food. I think it works out way better. This is making me really interested in checking out WW (for management, not really loss). So interesting. I’ve lost 35 lbs by counting points, so no calorie counting for me. I’ll stick with what has worked for me so far. About 3 years ago i lost 30 lbs on WW. Obviously this was prior to Pts+ so nutrition of items was not factored in as much as it is now. At that time using points worked for me but I also did not know as much as I do now about health and nutrition. Right now I count calories most days but I pretty much know the calories for everything (can’t help it) so I don’t have to look most things up. I think that different methods work better for me at different times. In the past I would occasionally pull my WW materials out for a few days just to get back on track but I’ve lost weight with both methods. I like the comradery of WW but I don’t mind calorie counting either. Very interesting! I’ve actually switched to tracking calories on Sparkpeople for now. I was just not doing as well on P+ as I had hoped, after losing 50 lbs on momentum. I actually feel like I have less restrictions now, especially because I love oatmeal, bread, brown rice, and other high P+/not high calorie foods. I haven’t yet tracked both but you have inspired me to do this next week to see where I’m at! 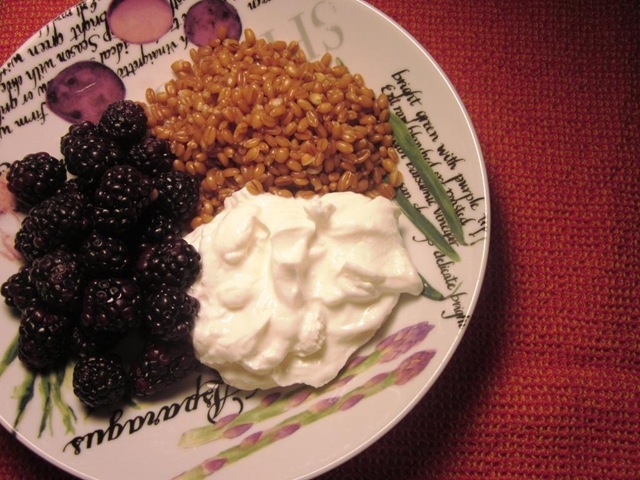 just for the record: those blackberries look amazing. I’m with you on this one Beth. I tried calorie counting..well HAVE tried…MANY MANY times and I enver stick with it. I think it’s for the same reasons. I felt restricted and like I couldn’t eat anything, even fruit, cause that would put me over my limit. So I always ended up not getting all the nutrients my body needed and always felt so tired. I love WW because if I am hungry, I’ll just eat a banana or a handful of baby carrots and not worry about getting in trouble! Any kind of health program that deters people from eating fruits and veggies needs some serious tweaking! I’ve never tracked calories but have done the WW points….and now that baby #2 has arrived I’ll be starting that up again soon! So intriguing! That is cool that you tried Spark People to get a sense for your calorie intake. I think it is cool to have a general sense for both points and calories and to see how both totals impact for your level of satisfaction. I hate hate hate hate hate calorie tracking. I have no clue why. Point tracking though, I LOVE IT! This has been my biggest challenge about being pregnant, I simply can no longer bring myself to calorie track – if it were points it would be totally different. That is very reassuring about the five servings of fruit, I always wondered how that 0 pts+ was figured for fruit and vegetables. I MISS WW!!!!!!!!!!!!!!!!! That’s really interesting! I like how WW makes all calories not equal, and counting calories could be misleading. 100 calories of crap doesn’t equal 100 calories of a banana. I’m not really good at counting calories, I haven’t found a site that makes it super easy. I’m also apparently not great at counting WW points, especially when I don’t eat at home. I don’t really do either. I do that whole “intuitive” eating thing and so far it’s kept me on track pretty well. When I was trying to lose weight I counted calories. It was the easiest way for me to monitor myself and really worked. I am on myfitnesspal.com, and I count calories, fat, protein, carbs, cholesterol and sugar. I joined WW 360 online today for 6 months. I am still trying to find my way around that and am a bit disappointed that they don’t show more store bought foods, such as bagged salads. It seems there are more restaurant foods listed. BUT I do understand that eating salad and fruits and vegetables are 0 points, so maybe I am over thinking it. Anyway, here’s to losing 80 lbs.! nice analysis…. Always wonder How you plan your daily menu. I’ve been on Weight Watchers for a couple of months now, and have often wondered why counting points seems so much easier than counting calories. I think I agree with you that it’s because there’s no hard limit if food for the day; if you’ve used your daily points you can just eat fruits and veggies or even dip into the weekly points.